Due to an increasing number of spambots trying to register for our forum, certain email domain names have now been blocked from registering for a forum account. So, if your registration is not accepted, this is the reason why. If this happens to you, then please email the team founder, via one of the BOINC project websites, and we can provide a work around for this. We apologise for any inconvenience this may cause new members, but there really isn't an easy solution to prevent spambots from trying to register. This forum was set up in 2006, to serve as a portal of information about (what was then) the new fangled BOINC program, that could harness the power of thousands of PC's to crunch datasets from many and various projects, but all using a common "program manager" to control what programs were being run. The concept of BOINC has caught on in the intervening years and there are many projects that you can join in with...and as such, you may have questions about how to operate your computer in the best way, so as to maximise your efforts efficiently. Of course, most BOINC projects have their own forums, but having a team forum allows for a wider range of topics to be discussed....and of course, other allied topics can be discussed too...which makes this more like a club, rather than a "haven for techy bods". So, please join in - we have a long-standing group of people who keep a regular eye on the forum, so any topics that require assistance are usually answered quite quickly. If you are thinking of joining this Forum, please use your BOINC USERNAME when you REGISTER on this Forum. This is VERY IMPORTANT, as otherwise, your forum membership will NOT be activated. Please note: This forum is open to ANY BOINC cruncher, but UBT members obtain special privileges. We always run a verification check that you are "crunching" for at least ONE of the BOINC projects before your account is activated. (This is because we have sometimes been plagued by spammers and hence we only want to activate forum accounts for REAL people). As of November 2015, the forum registration process has been repaired, as we now have a brand new, shiny version of forum software running (and with very grateful thanks to Janos for his help with the database migration and set-up). Once your account is activated, please post a "HELLO" message in one of the forums, so we know you are "REAL". Otherwise, if your account is not used, then we will mark it as a dormant account, which may then be deleted. This forum, like others, sometimes receives fictitious "registrations" from spambots - and it is our intention to keep this forum spam-free, in support of our Team effort to generate results for the various projects and to provide members with help, if they require it. If you register and do not subsequently log in to your account within 1 month, the account may be deactivated, without notice. 3) delete any links to non UBT or BOINC related websites, in order to keep our Forum software running smoothly. 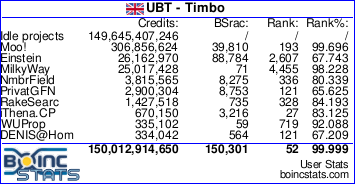 If you register with us (as mentioned, using your BOINC username) and contribute regularly to the forum, it will give us the opportunity to recognise your contribution in the BOINC rankings and hence we can then upgrade your membership to include access to the UBT Team Chat Area - which is ONLY accessible to UBT crunchers who are currently crunching for the Team on one (or more) of the projects. A minimum of 5 acceptable postings onto the forum is a pre-requisite for this upgrade. There are occasions when genuine BOINC crunchers join up and then don't re-visit the forum (for whatever reason) after they have joined up. As such it is possible that when we purge the Memberlist of recently joined "names" (esp. ones that are obviously spambots) that we may delete a genuine BOINC crunchers membership. If you have joined and your account HAS been deleted, please re-join and we'll ensure your account stays live, as long as you post a message soon after the account is activated....! Please note: We reserve the right to delete unused, inactive and/or dormant accounts - these will be removed as part of our general "house-keeping" to keep our forum database "tidy". Likewise, if URL links are added to accounts where NO posts have been made, then these links may be deleted at our discretion. Is it just me or is the team chat area missing? Woodles wrote: Is it just me or is the team chat area missing? Not missing - it is still here...but I need to sort out the user permissions for some sections (which is a whole minefield in itself - so, bear with me a bit as I get to grips with all the new admin stuff). Excellent - that proves to me that the tweak I made is working.